The Federal Circuit Advisory Council released a Mole Order for limiting the number of patent claims and prior art references. The Model Order "is offered to aid trial courts in the exercise of their discretion in crafting orders tailored to the facts and circumstances of each case." The technology is available now to improve some of the functions that lawyers typically perform. I truly believe that over the next few years, lawyers who embrace and utilize technology effectively–in particular Internet-based and mobile tools–will undoubtedly have an edge over their less tech-savvy colleagues. from MyCaseInc blog: Can you automate the practice of law? Our belief is that by replacing a typical patent lawyer function (manually organizing/analyzing patent claims and prior art in a folder structure) with new technology-based tools (database environment providing an edge over standard patent claim chart analysis), a lawyer can have a better grasp on the analysis. A deeper understanding of the more subtle issues can then be achieved. We focus on developing tools that enhance the understanding of the boundaries of patent protection. The tools can be applied to infringement and invalidity analysis, but the underlying principles are the same - what is the proper scope of the claims. If the claims are too broad based on the prior art, then a challenge can be made. Does the claim scope really reach an accused product or service? All of this is shaped by the prosecution history of the patent, prior art considered during prosecution, any stated reasons for allowance, and prior art not considered during prosecution. This is a lot of information to track, process and understand. Give us a call and see how we can help you in your practice. Following up on our earlier post, below is a quick illustration to show you how PatDek organizes claim concepts and uses the concepts to analyze prior art for invalidity contentions. As you can see, the concepts are defined using the Administration interface (left) and then used to analyze prior art references (right, top and bottom). In this way, the Administration interface establishes the concept for a case to be considered by a user when analyzing prior art references for a case. Here is a pictorial of the process that describes how to understand the idea of "concepts" as they relate to patent claims and prior art. The main idea, as shown in the graphic below, is that patent claims can be represented concepts. We utilize this process because patent claims often use the same or similar words to cover a particular feature. As above, the color-highlighting generally indicates features recited in the claim language. The different colors represent different features recited in the claim. The user determines how a claim can be divided into different concepts. In the next graphic, we show a group of concepts. Once concepts are identified for one claim, the same concepts can be used for other claims. As below, three claims can be represented by seven concepts. Because certain concepts are repeated (as indicated by arrows), they are reused in different claims. In a final graphic (below), the concepts are shown to link the patent claims and the prior art. By analyzing the prior art using concepts, the user does not need to repeatedly refer back to the claim language. The concepts, not claim language, are used to analyze the prior art (another post on claim concepts here). At this level of prior art review, different teachings of the references can be matched up together. These mashups of the references form patent claim charts and invalidity contentions. 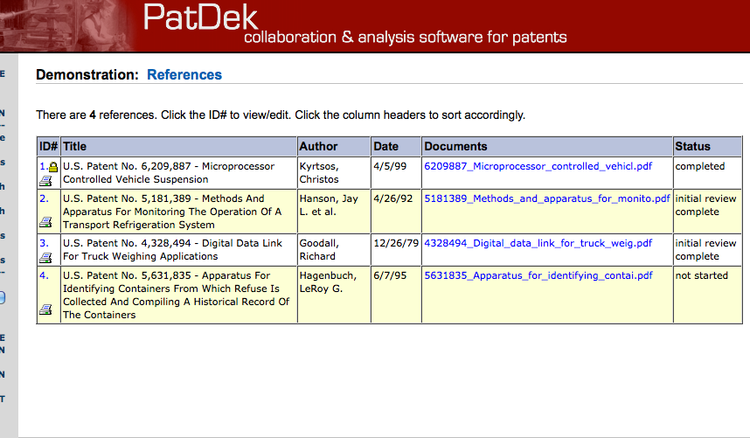 Using the PatDek interface, different prior art mixes can now be generated by the user. Has this happened in your patent litigation practice before? Discovery is ongoing and you're working on finalizing your invalidity contentions against 20-30 claims from 2 patents with your invalidity expert. Your case is well-organized, you've refined your invalidity positions, and selected the most relevant disclosures for your 102 and 103 contentions. Everything is, for the most part, under control. In litigation though, there's a reason why we expect the unexpected. Suppose now that the plaintiff-patent owner attempts to seize an advantage and asserts 2 more patents against your client adding another 20 claims into the case. If you weren't using PatDek, you would scramble a team of associates to extract portions of your existing invalidity contentions/charts and pull together another 50-60 charts against the newly asserted claims. If you were using PatDek for your case, the solution is much simpler. Step one - type in each patent number to add the newly asserted patents to your case. Step two - link your existing concepts to the new claims of interest for each newly asserted patent. Step three - select the claims and references you want in your charts. It really was that simple for one of our clients. In a couple of hours, the client had added in the new patents, linked existing concepts to 20 or so claims, and was generating invalidity charts against those new claims. The new patent claims were closely related to the other claims in the case so no additional concepts were needed, nor was a re-review of the prior art for new concepts necessary. If new concepts were required, the concepts could be added, linked to the relevant claim limitations, and a focused review of the prior art could be done looking just for the new concept(s). PatDek can adapt to changes in your case. Are you really prepared if you're not using PatDek? For joint defense groups (JDGs) crafting invalidity contentions, the overriding problem is merging the resulting analysis together. JDGs are formed with the desire to collaborate and share resources. There are several ways a JDG can collaborate to create common invalidity defenses. In one arrangement, the law firms forming the JDG divide up the references, draft invalidity charts for the references, and then circulate the charts to other JDG members. One law firm then collects the charts to assemble the JDG's invalidity contentions. The contentions would include a list of references, proposed reference combinations, a coordinating document with reservations of rights, and an appendix of charts. In another arrangement, each JDG member could serve their own individualized contentions, with the group merely exchanging charts for the set of prior art references. Each defendant simply leverages the initial charts and decides whether to include all or portions of the group's charts in its individualized contentions. Can this process be improved? We think we can help. If you've been reading this blog, you'll understand that we take a different approach. Instead of jumping into the process of prior art review and generating charts, we propose taking a step back to consider what claim features need to be extracted from the prior art. Once a set of features have been identified (representing all aspects of the target claims), the analysis process begins and ends by looking for these features in the prior art. With this process, the group's analysis of the features can be merged together. References can be directly combined into multi-reference charts. The relationship between multiple references can also be better understood. Gaps in the prior art can be identified quicker. This leads to a better assessment of whether additional searching is required. Charts can also be generated on command for any reference against any claim. With a web-based portal for the case, each JDG member has access to the prior art library and everyone's analysis. Each prior art contribution can be reviewed in real time. Since invalidity charts can be generated at the click of a mouse, the review process, not the charting process, takes center stage. A list of all references can be delivered with a few clicks so no reference is omitted. Combination lists can be easily generated. The main benefit, though, is that the group has a comprehensive understanding of each reference through various reports. Under a traditional approach with each defendant just creating invalidity charts, you were less likely to understand the references reviewed by other defendants. To help in understanding prior art reviewed by another JDG member, we've created a report feature that summarizes each reference. Instead of looking at a reference's disclosure in the form of an invalidity chart, we provide a feature-based report for each reference. The report provides citations and associated text for each feature disclosed by the prior art reference. You can see that quoted passages, citations, and the target patents for this reference are all included in the report. Depending upon priority date issues, you can designate whether a reference should be linked to a target patent for your invalidity contentions. If you'd like to see the entire 8-page report for this reference, just send us a quick note and we'll send it out to you for further review. In this post we'll consider a topic I've thought about for some time - crowdsourcing. The concept is not new and has been applied to photography, social networks, software coding, and in a very limited way, prior art searching. Back in 2002, we were confronted with the problem of organizing a large set of prior art references. Having been involved in a database project that organized IP assets, the database concept seemed appealing. We searched for a commercial solution to our problem, but came up empty. We thought about what we really wanted to accomplish and settled on a goal of extracting and retaining the most relevant information from each prior art reference so that the information could be quickly searched. We designed a tool for that purpose in 2002. The tool performed the retention function very well. Because of the way we configured the database, extracting relevant information via search, beyond a list of references, was difficult. In 2003, we developed a Microsoft Word scripting tool that crudely integrated with the database to generate a form of invalidity charts. So what does this have to do with crowdsourcing? We've developed a system that can handle multiple, concurrent connections to a defined problem. Think of the defined problem as a project template. The template identifies what information is sought, and the users provide information about the problem using the project template. In other words, define the problem - then solve the problem. To this end, we have developed a way to discretely define and present a problem - how to invalide patent claims - to a group of people. The system can receive input about the problem and mesh that input with input from other group members. Isn't this what crowdsourcing is all about? A more concrete example is a joint defense group defending against patent infringement allegations. One of the litigation defenses invariably is that the patent in question is not valid. The project template can be used to receive information from attorneys, at different law firms. This information is directed to the claimed features found in the prior art, to form the invalidity contentions relied upon the joint defense group members. We see the beginnings of a crowd for this type of project. The project template could even be used to receive prior art search result submissions. In this case, the searchers would be the crowd. Sounds simple enough and there are companies that already provide this service. Now imagine that instead of commissioning a search and having attorneys review the results, the searchers themselves have access to a platform for sharing their understanding of the prior art. Not just the prior art references, but information contained within each prior art reference as it relates to the defined problem. Not a writeup in a document, but data entered into a database to be mixed with the data from all other searchers. Under this approach, the individuals most knowledgeable about the prior art (the searchers) take the first pass at the analysis and record their analysis into the system. Attorneys would then review and vet how closely the analysis matched features found in the claims. Even Article One Partners, a noted leader in the search field, has not achieved this level of project focus. In the Article One crowdsourcing model, a search request is broadcast to a vast team of researchers. The researchers then review their archives and report back their findings by identifying relevant prior art, each vying for a bounty. The knowledge and understanding that each researcher has about the prior art is not transferred in this process, however. What if this could be done in a different way so that the searchers knowledge is transferred in the process? We think we can fill this gap with our system. Our system already provides a bridge that allows users to transfer their knowledge about the prior art using a project template. The information entered into the project template can also be used to generate invalidity charts because the template fields are already linked to the claims of the target patent. We have even considered a way to anonymize the identity of individuals inputting information into a project template if anonymous submissions are desirable. We believe this is a different way of thinking about prior art searching and litigation workflow. We hope you'll give us a few moments of your time and consider having us demonstrate the system to you and your team. Let's set a basic premise. This is being written in very general terms. The approach can differ based on the subject matter of the patent(s) under review. The subject matter of the patent often dictates the form of analysis undertaken. For example, at the most basic level, mechanical-based patents often focus on structural improvements that function more effectively; software-based patents often relate to efficiency improvements introduced through some novel logic or process; and chemical patents often highlight new material properties or unexpected applications. The trick is often to quickly identify the one or two specific features that are not readily apparent in the prior art in the relevant time period. The prosecution history may help identify that for you based on the stated reason for allowance. If the prosecution history is not helpful, sometimes the specific feature is easily identified because the claims recite a "new" term of art in the claims. The term may be new, but the feature may be well-known by another name. To locate that feature in the technical field, you'll need to look for variants of the feature in the prior art. Sometimes the feature is well-known, but is not well-discussed along with other concepts recited in the claims. In that situation, the focus usually revolves around seeking information about the feature in different contexts to find the contexts that best match the other recited concepts in claims. There are other searching techniques used. The main point is the need to identify the specific feature(s) that will be critical for the invalidity analysis. Once that is accomplished, you can catalog prior art that reaches all recited concepts in the claims, along with the specific feature. The difficultly often lies in figuring out what the state of the art is in a certain time period, what features were discussed in combination with each other, and how different features were described to solve specific problems. Some might argue that this cuts close to hindsight-based review. I would disagree because until you know the state of the art, who the players were, and what the industry focus was, you can't tell an effective story. We decided to use software to arrange the story elements much like a screen writer uses software to keep track of characters, settings and plot lines. In the end, this is all about the story you are telling. Your first cut at your invalidity contentions lays out all possible story paths. As you move towards summary judgment and expert reports the story is refined. The problem we see in Court decisions is that some of the possible story paths may be discarded if you don't disclose them early enough in the case. We've created a system that not only helps preserve all possible story paths, it can also help you craft the most effective story while you prepare for trial. We offer a 15 day trial to see how this system performs. Let us know if you're interested in a new approach. Software has transformed the document review process, leveraging technology to allow lawyers to be more productive during the review process. Why haven't similar advancements been applied to aspects of patent litigation, beyond document review? Consider part of an e-discovery blog post (reproduced below), which points out shortcomings of the document review process. The same idea applies to invalidity contentions - cut & paste, editing charts, changing citations - this is drudgery. "In short, by using predictive coding, the authors say that associates no longer have to suffer the drudgery of endless document review. Instead, they can spend time to understand facts and tell a good story, which is, after all, what litigators should do." via Strategic Legal Technology :: The State of BigLaw: What the AmLaw 100 2011 and Two Other Reports Today Tell Us. The discovery process has evolved so that technology now takes a first pass at reviewing large document compilations before attorney review begins. Instead of toiling away and churning documents, the attorneys spend more time analyzing the case and formulating thoughts that advance case strategy. PatDek is a first step in the right direction for patent contention workflow. The invalidity contention process should be about reviewing the art, understanding the art, and configuring the references to tell a story about the technology, not just presenting it. It's the art, and the story the prior art teaches, that matters. 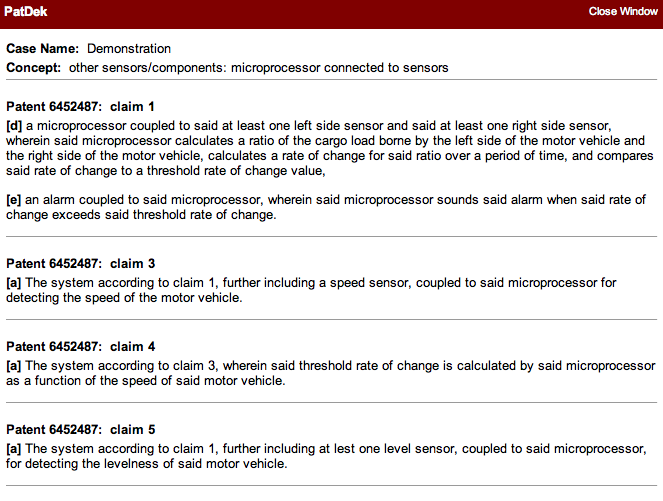 Here's a snapshot showing how a case-specific database can be configured to track features for claim limitations. Instead of looking at each claim, the database can be configured to look at specific aspects of a claim. This allows a review team to extract features from a prior art reference during the analysis phase, and also allows changes to be made for a reference, later when needed, directed to only portions of claim. This approach may seem non-traditional. We believe that this approach provides a solid foundation for the case team as the litigation advances from preliminary assessment, through preliminary contentions, onto fact discovery/contentions, and then as it moves to expert discovery and dispositive motions. The case is continually focused through the use of a database and changes to the data set. We can help you understand this revised work flow. Hopefully you'll consider how these different ideas can assist you when preparing your claim. You can view your evolving understanding of the target claims in different ways - claim limitation mapping is just one alternative. Would this Progress Table help you better understand how the prior art review process is evolving? 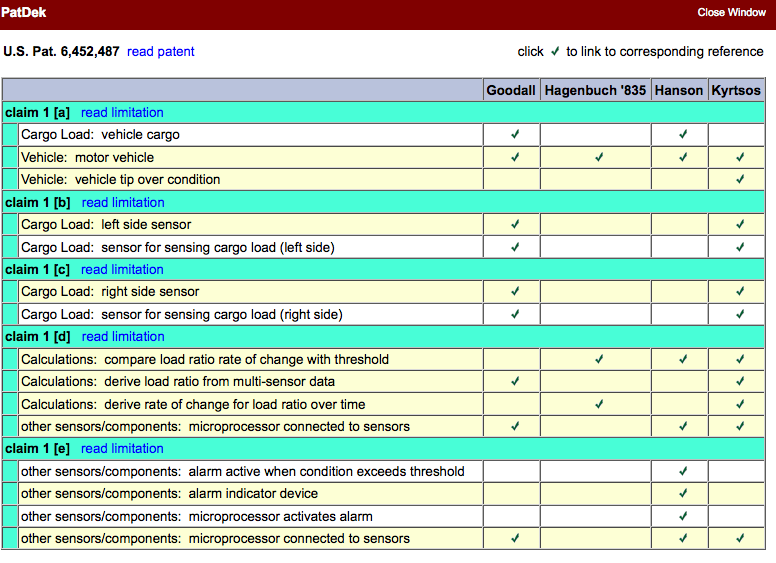 Do your invalidity charts give you this type of information? This is just one of many ways to help you better understand the claims of your case and scrutinize how the prior reads on the recited claim features. In-house counsel can benefit from this viewpoint as it helps discuss where the review process is and where it is heading. This is the type of information that can be relied on beyond the static invalidity charts. Litigation is about framing the issues. Software can help with that process. Do you organize your prior art like this? Stay tuned to find out how you can. We offer affordable, budget-conscious plans to use this software in your cases. You'll be surprised at how our system can enhance your analysis and save you time in preparing your invalidity contentions and organizing your defenses. We developed this system to help us on cases and you can now benefit from our experiences. Give us a chance to explain the benefits to you and your clients of a revised litigation workflow. Invalidity charts are just one feature of this software platform.